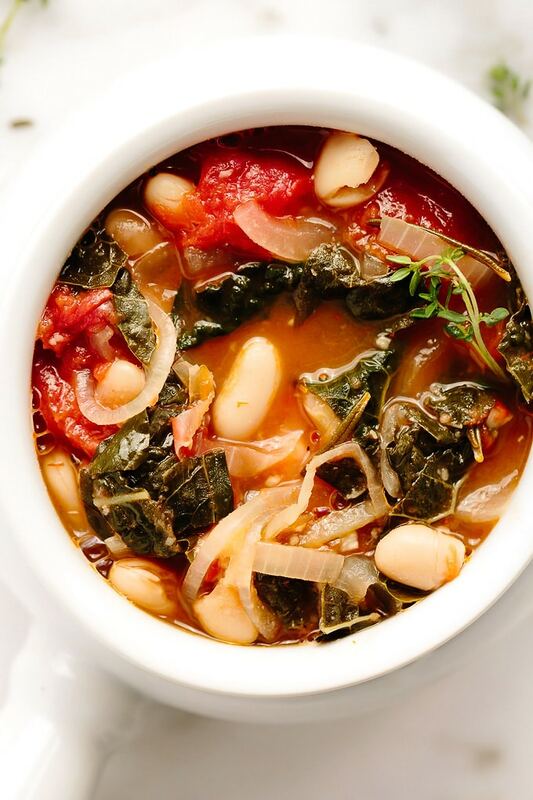 This vegan tuscan kale white bean stew is savory, satisfying, and comforting. Requiring less than 10 ingredients (plus s + p), little more than 15 minutes of active kitchen preparation, and a fairly hands off simmer, this soup comes together in a pinch. It’s the perfect meal for those busy winter weeknights, and each serving is PACKED with protein (13 grams) and dietary fiber (14 grams)! 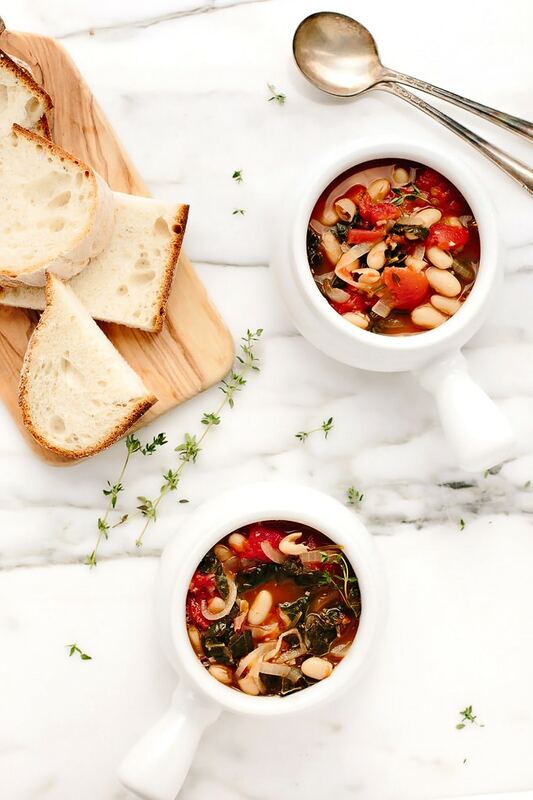 This simple, easy-to-make vegan tuscan kale white bean stew has turned out to be one of my favorite recipes thus far in the cold weather season. 1. It comes together with a brief list of easy-to-find ingredients—just nine simple ingredients plus salt and pepper. 2. It requires just 15 minutes of active preparation (i.e., slicing, chopping, etc. ), plus a few stirs here and there. 3. Despite its simple ingredient list, this stew is PACKED with flavor. Simmering the broth with a bundle of fresh herbs (i.e., rosemary and thyme) infuses it with a rich, aromatic, and irresistible flavor. 4. It’s rich with protein and fiber. One serving (about one-sixth of the recipe) packs a whopping 13 grams of plant-based protein and 14 grams of dietary fiber. 5. It’s brimming with potassium (30% DV), vitamin A (191% DV), vitamin C (132% DV), calcium (17% DV), and iron (36% DV). 6. It’s incredibly satisfying. There’s something so unexpectedly and undeniably comforting about this stew. 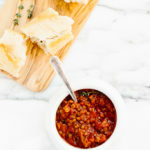 It’s perfect all on its own and can be taken to new levels of comfort with a side of hearty bread or crunchy crackers. 7. 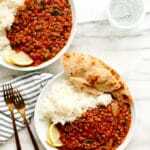 It can easily be doubled or even tripled (if you have a pot that will accommodate the volume) for a crowd or to be frozen and enjoyed for quick, reheat-n-eat meals. 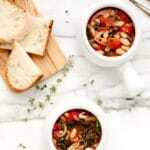 So, without further ado, allow me to show you how to whip together a batch of this simple, easy, and flavorful white bean stew. To start, heat a bit of olive oil in a large stockpot or dutch oven over medium-low heat. 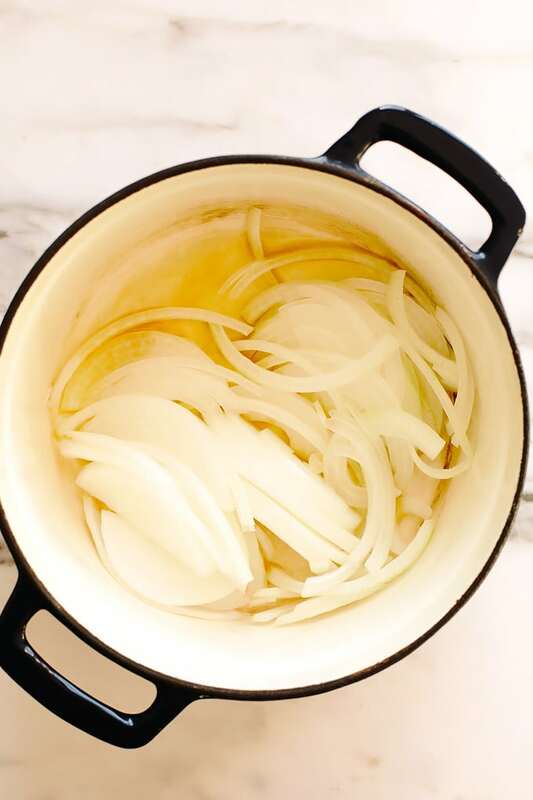 Halve and thinly slice a white onion and add it to the pot. Sauté for about 5 minutes, or until it becomes soft and translucent. Then, add four cloves of minced garlic and cook for another minute, or until the garlic mellows. Now it’s time to get a tiny bit messy. For this next step, I suggest arming your clothes with an apron, unless you don’t mind a stray splash of tomato juice here and there. Hand-crush a can of whole peeled tomatoes into the pot, adding any leftover juices as well. Then, add a quart of vegetable broth and a bundle of fresh thyme and rosemary. Give everything a good stir, bring the mixture to a boil, and then reduce the heat, cover, and simmer for about 15 minutes. Once the base of the soup has finished simmering, use tongs to carefully retrieve and discard the herb bundle. 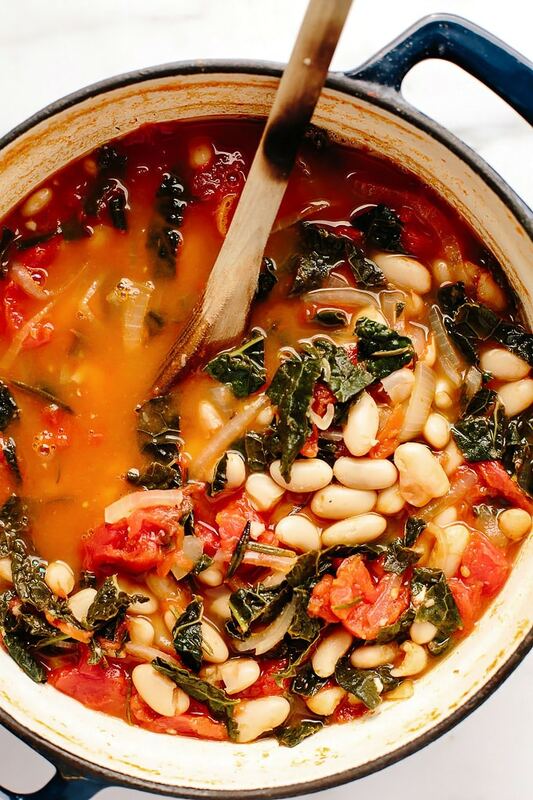 Then, stir in one bunch of chopped lacinato kale and three cans of drained and rinsed cannellini beans. Give everything a stir and continue to simmer for just five minutes, or until the kale begins to soften and wilt. Turn off the heat, taste, and season with more sea salt and freshly ground black pepper. 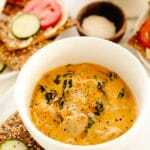 Finally, ladle the soup into bowls and serve warm on its own or with a side of hearty bread and/or crackers. 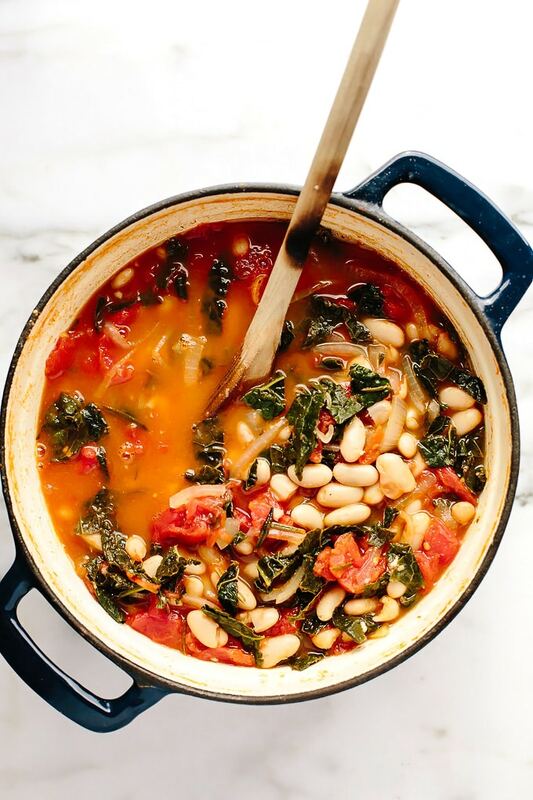 This vegan tuscan kale white bean stew is savory, satisfying, and comforting. Requiring less than 10 ingredients (plus s + p), little more than 15 minutes of active kitchen preparation, and a fairly hands off simmer, this soup comes together in a pinch. 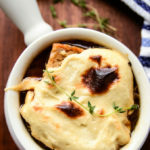 It's the perfect meal for those busy winter weeknights! Heat the olive oil in a large stockpot or dutch oven over medium-low heat. Add the onion and sauté for 5 to 7 minutes, or until soft and translucent. Add the garlic and continue to sauté for another 1 minute, or until softened. Use your hands to gently crush the tomatoes into the pot (you'll want to use an apron for this step), adding any leftover tomato juice from the can as well. Stir in the vegetable broth. 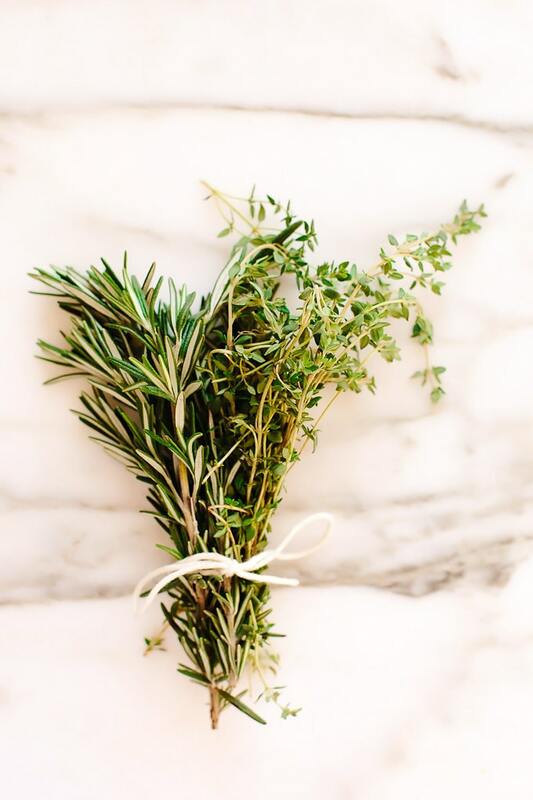 Use kitchen twine to tie the thyme and rosemary together into one bundle. Add the herb bundle to the pot along the with sea salt. Increase the heat to medium-high, and bring the soup to a boil. Then, reduce the heat, cover, and simmer for 15 minutes. Use tongs to carefully retrieve and discard the herb bundle. Then, stir in the beans and kale, and continue to cook for 5 minutes, or until the kale begins to soften and wilt. Turn off the heat, taste, and season with more sea salt and black pepper, to taste. I usually add another 1/2 teaspoon sea salt. This looks delicious! 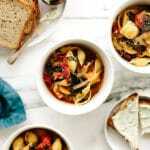 I love warm and hearty stews, especially in the Winter. I see in the photos that you used a dutch oven–do you know how many quarts it is? Thanks, Danielle! It’s a 5-quart dutch oven—definitely on the smaller side! Just made this! It came as I was braving the storm outside and it was exactly what I needed. I subbed 1 can of chickpeas for 1 cannellini because it’s what I had, thumbs up to this quick and easy recipe. I really enjoyed your “things I’m afraid to tell you” post. Your honesty drew me in and inspired me to do the same at least for myself in a journal. I hope you’re doing well with the little one. Happy new year! And thanks. Glad you enjoyed the recipe, Amanda! Thanks for taking time out of your day to come back and share your thoughts—means a lot and is helpful for me and others, too. Also, happy to hear you enjoyed the Things I’m Afraid to Tell You post, too. The little one and I are doing well and navigating this new experience together. Definitely starting to find that parenting groove these last couple of weeks, which is wonderful. Happy New Year to you as well. I just wanna know about THAT BREAD!! Thanks, Iris! The bread is a sourdough boule from Whole Foods. Very tasty! Made this tonight – perfect for the rainy day we had. It was quick and easy to make, yet full of flavor (and nutrition)! So happy to hear you enjoyed it, Connie! Thanks for taking time out of your day to come back to rate the recipe and share your thoughts—so helpful for me and for others, too. This soup is fantastic!! I’ve been sharing the recipe with everyone! I am NOT at all a soup fan but it looked so easy and it’s freezing cold here so I gave it a go. I was really impressed with the flavor. I usually find soup to be boring or too salty. I did add some all purpose seasoning but not sure it needed it. I also made a pot of brown rice to go with it and stirred some in my bowl just because I’m not a soup fan Lol! 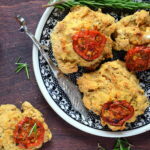 Great recipe can’t wait to make it for company! This was extremely easy to make! It was quite delicious and satisfying. This recipe has become a staple. Thank you for the recipe. So happy to hear you’re enjoying it. Thanks for taking the time to come back and share your thoughts and rating—means so much! With a husband who has recently gone vegan, this was a hit in our house. I followed the recipe as written and the only adjustment made was adding about 1/2-1t of paprika with the kale and beans. That little extra spice helped amplify the flavors. When serving, we threw in some cooked Tofurky Italian sausage for him and regular sausage for me. Overall, really nice! Thank you! So happy to hear you and your husband are enjoying the recipe! Thanks for taking time out of your weekend to share your thoughts and adjustments—so helpful for me and for others, too. Happy cooking! In the crock pot….looking forward to dinner tonight. Thanks for your recipes, I’ve made four and love them all! Oh wonderful! So glad you’re enjoying the recipes, Renee. Hope you enjoy this one tonight, too!